There is a number of towns and villages throughout this parish that once had a Church of Ireland parish church. Although those churches have closed, the towns and villages are still within the parish, and they often have resident parishioners. After the united group Eucharist in Rathkeale on Sunday, two of us visited Ballingarry, which is 8 or 9 km south of Rathkeale, on the road towards Charleville. We were in search of the former Church of Ireland parish church, but ended up looking at the two parish churches, the ruins of the old castle built by the de Lacy, some interesting Victorian shopfronts, and The Turret, a curious family home dating back to the 17th century, but with a story that dates back many more centuries. Ballingarry was originally a walled mediaeval settlement. 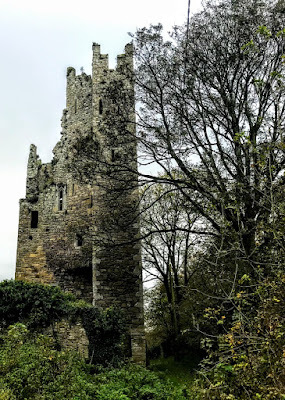 Often, the gardens and lands of mediaeval town lay outside the town walls, but in Ballingarry they lay inside the walls, giving rise to the Anglo-Norman and Gaelic names such as La Garthe and Baile an Gharrai. In the Middle Ages, there was a number of religious houses in the area. The earliest of these houses is said to have been founded by Donough Carbrae O’Brien for the Conventual Franciscans, although it is generally believed that Fitzgerald, Lord of Clenlis, founded the house. The FitzGeralds founded a Cistercian abbey dedicated to the Blessed Virgin in 1198. The name of Knight Street is said to recall a former Priory of the Knights Templar, who are also said to have had a house on the site of Saint Mary’s Church, Askeaton. Samuel Lewis says the preceptory of Knights Templars was founded here in 1172. After the suppression of the order in 1304, the preceptory was granted to the Knights Hospitallers. Garth was also one of the six deaneries in the Diocese of Limerick in the 13th century, and at the time consisted of 12 parishes. The de Lacy family is mentioned on record as far back as the early 14th century, and it is likely then that Ballingarry owes its existence to the illustrious Norman family settling there. Ballingarry Castle is still referred to as the de Lacy Castle. The castle is situated off Knight Street, and for generations was the home of the family, who are said to have fled Ireland as part of the Flight of the Wild Geese in the 1690s after the Treaty of Limerick. 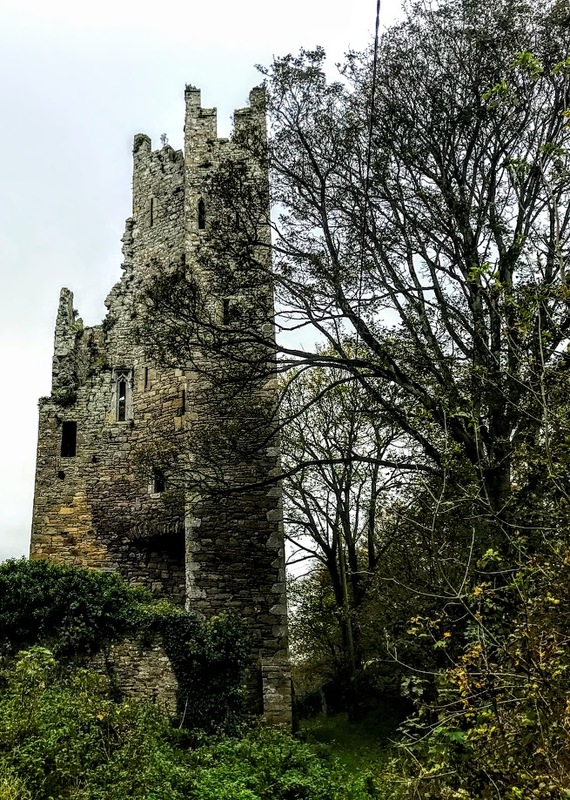 Ballingarry and the castle are said to have been destroyed at an early time by ‘Irish foes and English rebels.’ But the castle and the town were rebuilt in the 15th century. In 1408, King Henry IV gave the bailiffs of Ballingarry (Garth) taxes and customs to repair the defences and to wall the town, as unwalled settlements like this were vulnerable to attacks from hostile neighbours. Ballingarry Castle became a stronghold of the FitzGeralds or Geraldines of Desmond while it was held by the de Lacy family, who were related by intermarriage. In 1569, the castle garrison of 40 soldiers was slaughtered and the castle was captured for Queen Elizabeth I by Captain John Ward. The castle was forfeited by the de lacy family after the defeat of the Earl of Desmond in 1583, but was soon pardoned and later reinstated. In the years that followed, however, Ballingarry Castle changed ownership several times. In 1607, John de Lacy surrendered the castle and his lands to Richard Boyle (1566-1643), Earl of Cork, although the family seems to have continued to live there under terms of surrender and regrant. On 19 May 1630, the Earl of Cork leased Ballingarry Castle, as well as the lands, rectory and tithes, to David de Lacy, son of John de Lacy, for 21 years at a rent of £75. But Boyle reserved the patronage of the living to himself, granting it to his cousin, Richard Boyle (1574-1645), Archdeacon of Limerick (1605), Bishop of Cork (1620), and Archbishop of Tuam (1638). 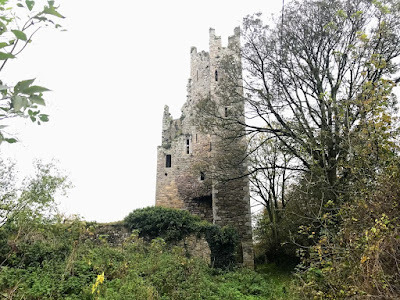 The de Lacy family was still living at Ballingarry Castle when William Lacie lost the lands and titles with the Cromwellian confiscations in the 1650s. Further losses followed with the Jacobite and Williamite wars. As the de Lacy family was being forced to leave Ballingarry, the Odell family, who were among the first settlers of the Munster Plantation, became the most eminent family in the Ballingarry area and remained prominent for several centuries. Major John Odell became the landlord of Ballingarry and Castletown in 1667 after he bought a long lease on Ballingarry, including lands confiscated from the de Lacy family. He was High Sheriff of Limerick in 1678-1679, and he and his family lived in the de Lacy castle before building ‘The Turret’ and moving there in 1683-1685. Major Odell was a cousin of William Odell, a colonel in the Limerick Militia and MP for Limerick for 26 years, as well as High Sheriff of Limerick. Meanwhile, after the Siege of Limerick, many members of the de Lacy family became ‘Wild Geese,’ joining armies across Europe, including Spain, Austria, Russia and beyond. Count Peter von Lacy (1678-1751), who had been born into the de Lacy family in Co Limerick, fought with fame and distinction as a Russian imperial commander under Peter the Great and was Governor of Riga. Until the early 19th century, the de Lacy castle served as the glebe house in Ballingarry and was lived in by the Rectors of Ballingarry, giving it the alternative name of Parson’s Castle. It must be the most unusual former rectory within my parish. The castle was repaired in 1820s, and then served as a barracks during local disturbances in 1827; it was later used as a hospital during a cholera epidemic. Ballingarry had become a booming economic centre, with a thriving linen and weaving industry and a vibrant farming sector. Ballingarry had 1,700 residents, including weavers, boot-makers, carpenters, harness-makers, smiths, nail-makers and chain-makers, and it was said 1,500 linen looms were active in the town in the early 19th century. But the Great Famine (1845-1849) decimated the local population and destroyed local industry. By the 1890s, the population of Ballingarry had fallen to under 700. 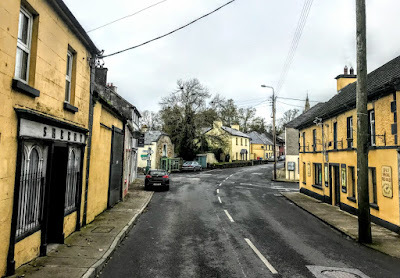 In the mid-19th century, Castle Lane was a fashionable part of Ballingarry, and Dr Robert Odell lived in the castle for many years with his wife and children. But the castle has since been abandoned, and has crunbled, and in recent years was used as a cowshed. Today, the ruins of the de Lacy castle are abandoned, and a ‘No Entry’ sign on a gate topped with barbed wire has toppled down and has been trampled across. The sleepy village retains many of its colourful Victorian shopfronts and its attractive streetscapes, and also boasts a celebrated restaurant and country house hotel. We went off in search of ‘The Turret’ and the two parish churches.